By the time of the championships, the stadium will be significantly modernised and its capacity expanded from the current 70,000 to 90,000 seats. In six years, Moscow will become the Mecca of world football. The legendary Luzhniki sports complex in the southwest of the city will host the opening ceremony and final games of the 2018 World Cup. Guests from all over the world will flood one of Europe’s largest megapolises to enjoy the best of football and to have a great time. 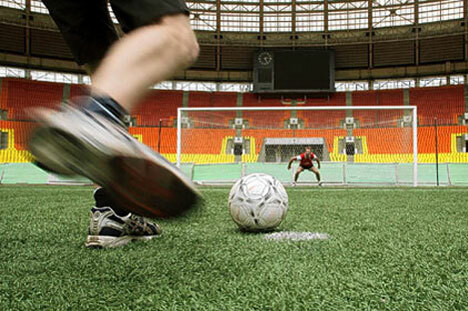 Part of the World Cup finals will be played at the more than half-a-century-old Luzhniki stadium. Ranking among the world’s top sports arenas, it was the main competition venue of the 1980 Moscow Olympics. By 2018, the stadium will be significantly modernised and its capacity expanded from the current 70,000 to 90,000 seats. But while technologically revamped to meet the latest sports standards, it will retain its authentic architecture. In addition to Luzhniki, some of the final matches will be played at the brand-new more then 40,000-seat Spartak stadium in northwestern Moscow. Construction is slated to begin shortly. Moscow expects hundreds of thousands of football lovers to pour in for the 2018 World Cup. There will be special fan zones in every park, and probably even in Red Square, where huge screens will be installed, broadcasting all the games live. Thousands of restaurants, bars and clubs will stay open round-the-clock, offering the best of Russian and foreign cuisine. As far as the accommodation is concerned, Moscow has enough five-star and low-cost hotels, and cheaper hostels for all tastes and budgets. The metro is recommended by tour operators as the fastest way to move around the city. It’s cheap, you won’t get stuck in traffic jams, and it’s also one of Moscow’s visiting cards. The palace-like décor of many metro stations is really worth seeing.